Beyond providing data for all 32 NFL teams, PFF also supports network broadcasters with game-preview packets that are used to enhance the in-game experience for fans and viewers. 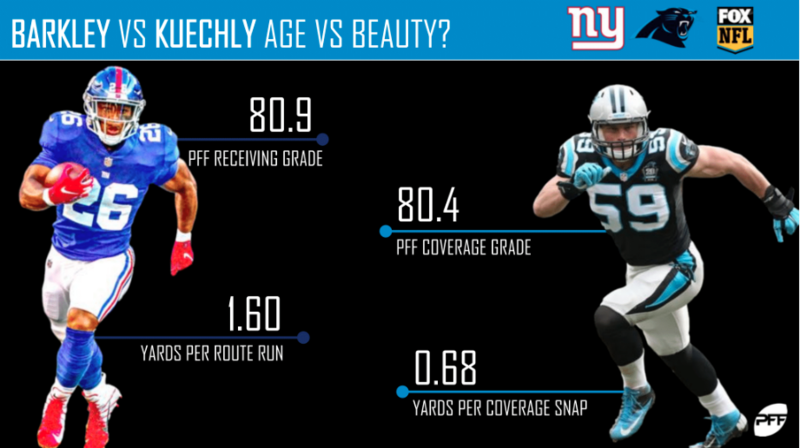 This Giants-Panthers preview features the same information our broadcast partners use for team research and in-game production. Eli Manning’s yards average depth of target through three weeks is the fifth-lowest average among signal-callers this season. 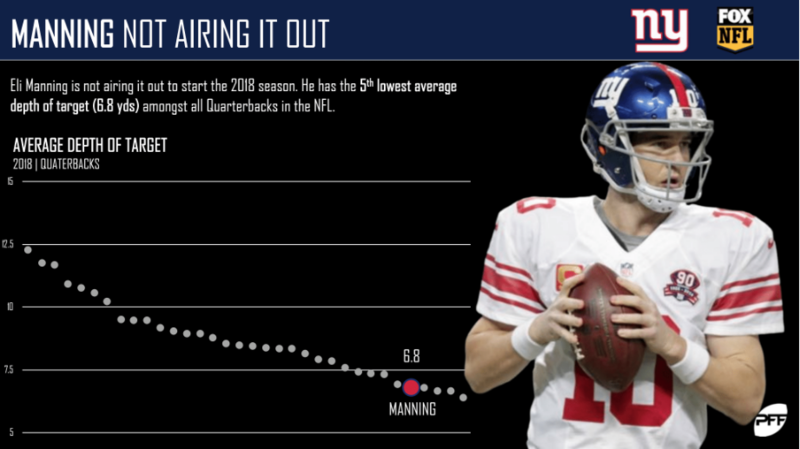 Part of Manning’s decline in aDOT can be attributed to his tendency to target the running back this year, as he is targeting running backs on 26.5% of his passes, the seventh-highest rate among quarterbacks. 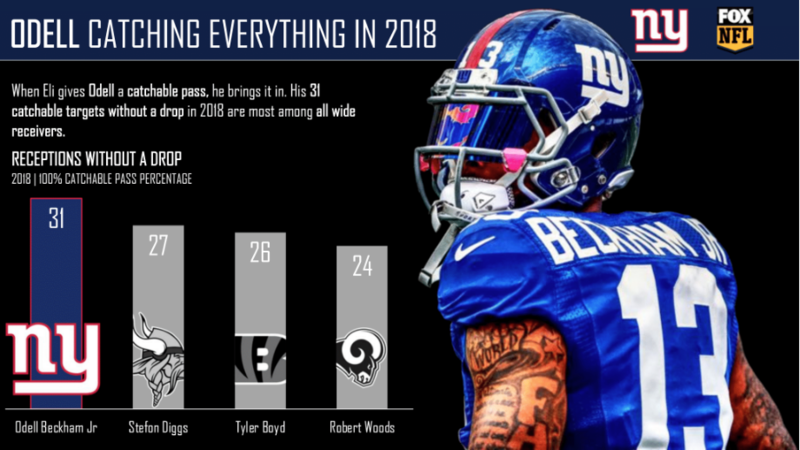 Odell Beckham Jr. has had an incredible season thus far and hasn’t dropped a single one of the 31 catchable targets that Manning has thrown his way. 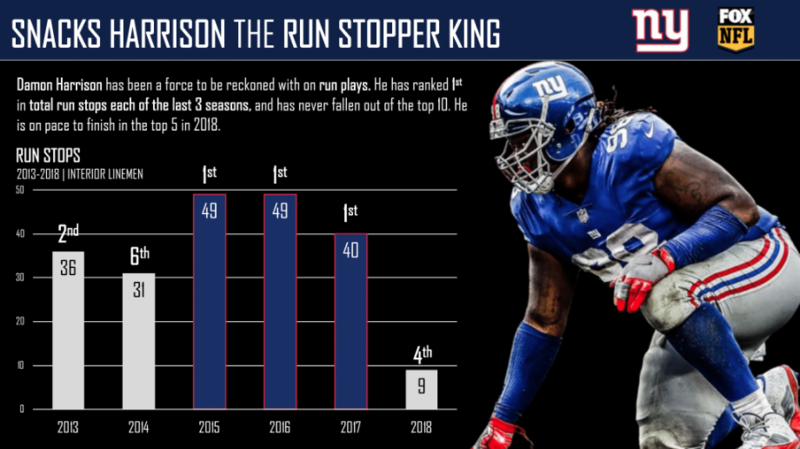 Damon Harrison has been gobbling up running backs for what feels like ages. The stalwart veteran has ranked 1st in total run stops for each of the last three seasons and is currently ranked in the top five this season as well. His run-defense grade for the season is 91.6, which is the highest mark of any interior defender, edge player or linebacker. 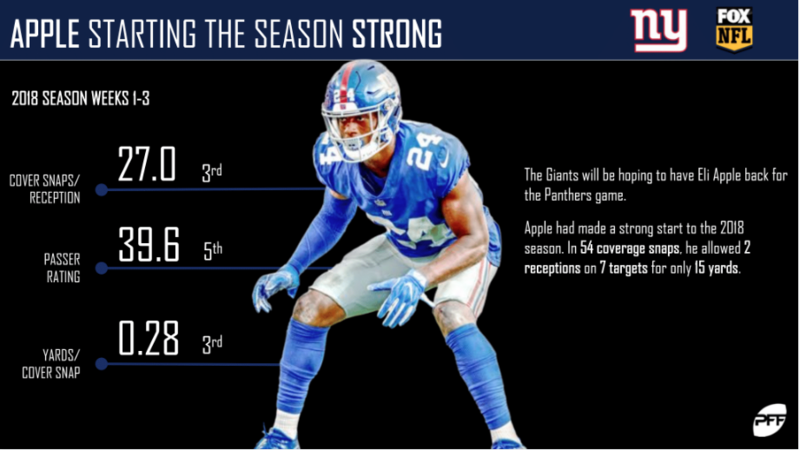 Eli Apple has had his shares of ups and downs, but this season has begun on a high note so far. Among cornerbacks with at least 75 snaps, Apple’s overall grade of 78.6 ranks fifth and his coverage grade of 78.9 ranks seventh. 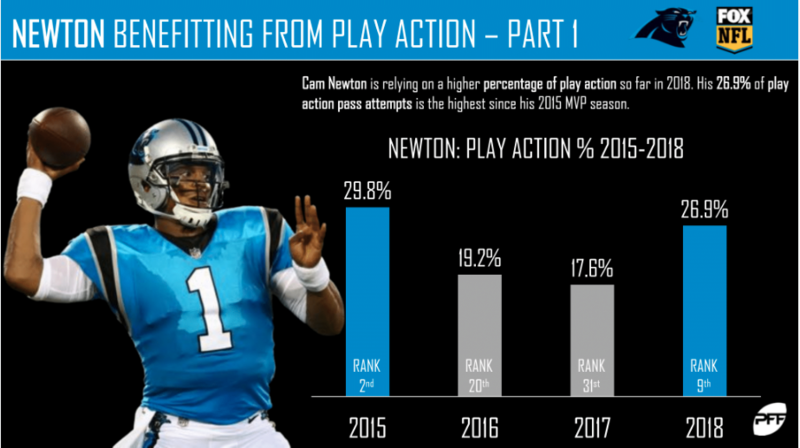 Cam Newton has been relying on play action more frequently this season, and the results speak for themselves. Compared to standard dropbacks, Cam Newton’s passer rating is 43.2 points higher when running play action. 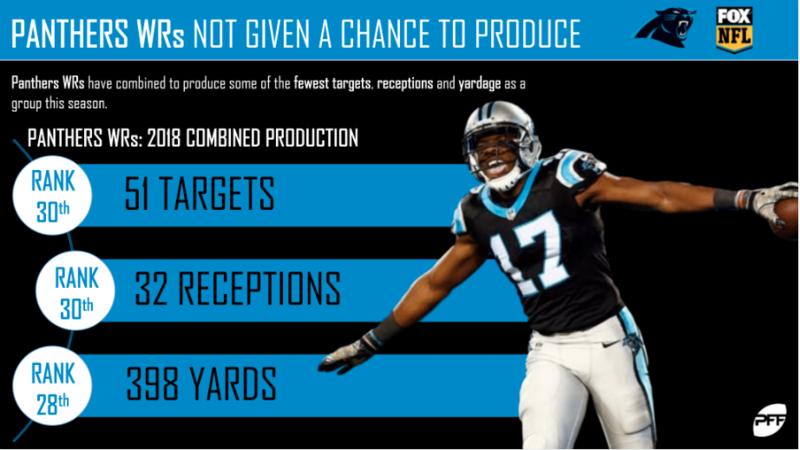 The wide receivers for the Panthers have struggled to get going this season. The group has a collective 398 yards and 32 receptions through three weeks. The receiving corps has to do more, and rookie D.J. Moore could be the answer to the problem. The rookie receiver has seen an uptick in his snaps week-to-week, and his explosion and physical ability could provide a lift to a flat passing offense. Luke Kuechly has continued his assault on opposing offenses this season and doesn’t look to be losing his touch. 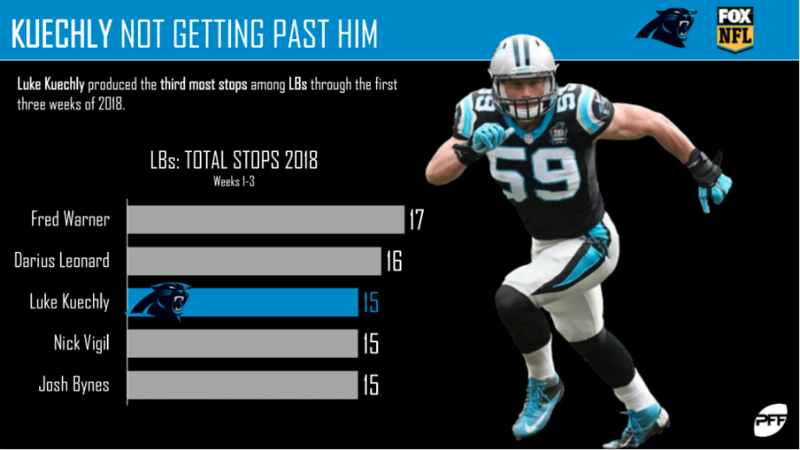 Through the first three weeks, Kuechly produced 15 run stops, which is third-most among linebackers. His overall grade of 80.5 ranks seventh among linebackers with at least 100 snaps and his coverage grade of 80.4 ranks eighth. Many people expected the Panthers front seven to be fierce, but it’s been the team’s cornerbacks who have shone so far. In three games, they have allowed just 6.55 yards per target which is the fifth-best mark in the NFL. 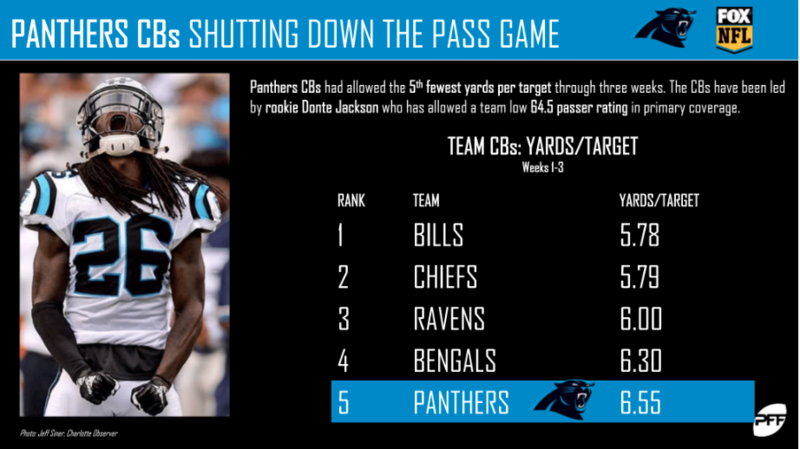 They are led by stand-out rookie Donte Jackson, who ranks 12th in passer rating when targeted (64.5) and 23rd in yards per coverage snap (0.89).